On Time In Full has been added to your cart. Go to shopping cart. 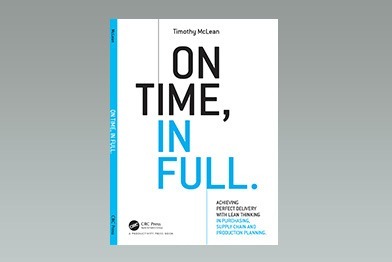 On Time, In Full looks beyond the software and the math and examines the human and organisational factors that cause supply chains to fail. inclulding managing supplier and customer relationships. The book is easy to read and talks in clear language about the problems that face supply chain professionals every day - and how to overcome them. This book is a practical guide for manufacturers on how to meet a fundamental requirement – how to deliver to the customer the right product in the right quantity at the right time. While the concept of on-time delivery seems deceptively simple, achieving it can be incredibly complex. This book unravels this complexity and provides simple, practical solutions that will enable every manufacturer to delight customers with reliable, consistent on-time supply at a competitive cost. It covers the end-to-end process of delivering an order to the customer, from understanding customer demand and forecasting, through production scheduling, supply of materials and delivery of finished goods.